I’m a little late due to travel, etc. But here’s the digelst from last Thursday’s final conference presentations. Sjors Scheres showed the next step in DNA origami enhancement of cryo-EM imaging and tomography. Aleksei Aksimentiev talked about nanopore work. Zorana Zeravcic was of particular interest to me because she was looking for rule-sets for computational self-assembly of particles. This basically is the theoretical framework for building larger scale structures from nano-powered micromachines. I have been thinking about how to program a microparticle in a “swarm” to act like a state machine, and I have some ideas. I have understood that such machines can be programmed since Eric Klavins’ class in graduate school. But this was another step that I have only a glimmer of an idea about: colloids in 3D creating self-replicating meta-patterns. Andrew Phillips is from Microsoft. He talked about his meta-language for compiling DNA circuits from a higher level of abstraction. I think that’s great but I have not learned to use his software effectively. I need to learn it and I would love to find/create an index of the software ecosystem around DNA strand escange. Alexander Deiters talked about his “side projects” in logic gates functioning in human cells. In particular, he made caged DNA that only does strand displacement after UV irradiation and could show that these SD reactions would occur in HEK cells after being transfected in directly. I think that surprised everyone, even him. Zev Gartner showed some simply amazing work on using hydrophobic-modified oligonucleotides to label and assembly cells. He makes microtissues that display some amazing emergent behaviors that are not evidently seen in the cell types by themselves. One of the most striking examples was when he put few RAS mutant cells in with many non-mutant cells, he got hyper-motility. But in the reverse scenario there was not hyper motility. Something about the physical/chemical environlemnt of normal cells made the RAS mutant cell behave very interestingly. Image from: Liu JS, Farlow JT, Paulson AK, Labarge MA, Gartner ZJ. 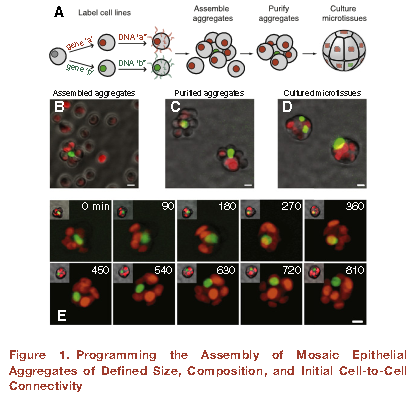 Programmed Cell-to-Cell Variability in Ras Activity Triggers Emergent Behaviors during Mammary Epithelial Morphogenesis. Cell Reports. 2012 Nov 29;2(5):1461–70. This entry was posted in Uncategorized on April 22, 2014 by Peter. Zvonimir Dogic talked about dynamic phenomena – things that move and change while consuming energy. Microtubules and microfilaments are useful systems to study… they can be observed directly. Kinesin doing some interesting sliding dynamics. I like that his movies have subtle timestamps in the upper left. His microscopy is so clean. I want to know what scope he was using and how it is maintained. He showed 1mm sized views with beautiful across-the-board quality. The focus stays perfect for a highly extended time. The depletion interaction – PEG exclusion – is a nice way to exclude things to the surface, for instance. From “Spontaneous motion in hierarchically assembled active matter,” Tim Sanchez, Daniel T. N. Chen, Stephen J. DeCamp, Michael Heymann and Zvonimir Dogic, Nature 491, 431-434 (2012). Scale bars are 20 um. 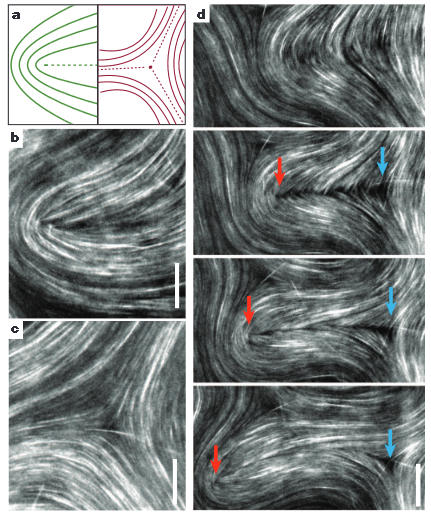 He showed great movies of microtubule bundles at interfaces forming an actively advexing chaotic gel. Capillary flow actually emerges from the system. The topic turned to the topology of liquid crystal defects which is a surprisingly universal aspect of mathematics. Jonathan Doye talked about mechanical properties of DNA as modeled in a medium-grain simulation. The model is a simplified version of DNA that is still being improved to incorporate the finer features of DNA structure. But the coarse features – pairing, stiffness, etc. – are still useful. Including modeling origami and nanodevices like a walker. But one reasonable model conclusion was that mismatches can accelerate the rearrangement to the minimum. It looks lime this model might explain the some strange phenomena talked about at DNA19 by Niranjan Srinivas that showed an anomalously slow kinetic step in the strand displacement reaction. Damien Woods talked about self-replicating nanostructures. He wanted to make a soup of DNA that could form into a long tubule, but would do so incredibly slowly unless there were little tubule seeds floating around. He then introduced some seeds; tubules grew. Even better, as they grew really big they could be made to break in half and thus create more tubes. Carlos Castro showed some very dynamic 3D DNA origami structures which were very pretty. The assembled TEM movies make it seem very tangible. The structures could in principle be used to do some force spectroscopy by exploiting the entropic spring properties of ssDNA. I was very happy to see Niranjan Srinivas from the Winfree lab give his talk on the kinetics of strand displacement. I have been trying to remember the details since DNA19. There are some anomalies in the rates of certain steps of toehold mediated strand displacement that are very counterintuitive. I gather that the issue is some subtle rearrangement that is captured by the models shown in Jonathan Doye’s talk. Katherine Willets and Joel Harris talked about analyzing surface bound fluorescent DNA which was very informative. Making dyes that can be turned off is obviously very important. Inverse DNA-PAINT with temporary quenchers might be an interesting solution to some of the high-density issues that prevent good localization of the Gaussian centroid. Ibuki Kawamata talked about some DNA crosslinked gels and showed some interesting results where a steel ball would be suspended on top of a gel, giving a quantitative readout of its degree of crosslinking. Could one analyze a movie of a steel ball falling through a gel (or use a magnetic sensor?) and compute the viscosity? That would be a pretty convenient viscometer. This entry was posted in Uncategorized on April 16, 2014 by Peter. Mike Ramsey talked about nanopores and nanochannels. Making these nano-analytical devices looks easy in his movies, but nanofabrication is no mean feat. Getting lithography to behave at the 100 nm level with enough reproducibility to do their experiments was very impressive. They used a channel that step-tapered. A single DNA molecule was threaded into that channel with an electric field. Then they looked at the apparent length in different channel widths. A reasonable person might run a bunch of DNA molecules through a bunch of different-width channels, but then you run into statistical averaging problems. Use the same molecule over and over and the physics pop out more simply. In narrower channels, the DNA must be straighter – no wiggling. That means it looks longer. The mathematical relationship between confinement and apparent length then pops out at a single-molecule level. They are also doing moderate vacuum (instead of very high vacuum) mass spectrometry. You know, because everyone wants a little MS on their bench. I know I do. David Zhang talked about ultra-specific DNA probes. It’s a competition assay, not very sensitive, but coupled to PCR it allows for super bright, super simple single-nucleotide-mutation detection. Shana Kelly talked about some of the limitations in analyzing rare molecules in serum with back-of-the-envelope calculations to describe just how hard that is. They have some great high surface area nanodevices that help. Kevin Plaxo talked about electrochemical readout of DNA-DNA reactions which I think should definitely be coupled to the Zhang probes (and probably already are). Electrochemistry is super reliable in commercial products, so coupling it to these new bioassays is very smart. I love that they have a biochip that takes whole blood and looks for drugs in that blood-flow in real time. And they use a laminar flow system to keep the electrode from getting all saturated with cell debris which I think is brilliant. I say a great talk about about releasable nano-DNA-icosahedra that encapsulate dextran FITC. I only caught the end of Peng Yin’s talk, but his ideas are all over the poster sessions including one on (if I understood correctly) inorganic nanoparticles from a DNA scaffold. There was a nice talk by Hareem Maune on self assembling DNA origami-like structures on surfaces other than mica. I was interested to hear that the old stand-by APTES is a problem (amino propyl triethoxy silane). which I have used to functionalize glass before They prefer an imidazole silane which evidently chelates metals and pulls DNA onto the surface by bridging di-cations. The last few talks included Nicholas Kotov talking about self-assembly of inorganic particles. One particularly interesting phenomenon generated monodisperse particles from polydisperse muilding blocks. It reminded me of the old fable of the big rocks and the sand. If you put big rocks into a jug first, you can pour in the sand on top. But if you put the sand at the bottom, you can not fit all the large rocks in on top of it. This is the same thing. Big particles come together and then build smaller particles into the cracks. The system maximizes surface interactions while minimizing surface charge and the whole thing finds a nice energy minimum with very uniform products. Anders Okholm and Chun Geng talked about DNA containers from different perspectives. The former used origami cages while the latter used DNA crystals. Both got lively questions. This entry was posted in Uncategorized on April 15, 2014 by Peter. The morning session of FNANO consisted of a suite of presenters who discussed their photonics and self-assembly techniques. Ralf Jungmann talked about the DNA-PAINT technique which I find really remarkable. The idea is strange: transient interactions + fuzzy pictures + math = sharp pictures. One can image a single molecule with fluorescence microscopy (this has been done for 20 years) but the details get lost. It just looks like a cloud and it doesn’t matter how good a microscope you use. It will always be a cloud. DNA-PAINT is designed to generate such clouds over and over. By carefully analyzing the series of transient fuzzy clouds, a computer can find their exact centers. By comparing the centers of all of the clouds (which overlap but appear at different times; I said it was weird) the computer can construct an image that is waaay below the limit of normal microscopes. I love it and want to try it. Yan Liu and Philip Tinnefeld both talked about using carefully arranged metal structures to have a strong impact on how light interacts with matter. For instance, two metal nanospheres on either side of a fluorescent molecule make that molecule considerably brighter – like hooking it up to an antenna. Some thought was given to the relationship between humans new entry into engineering on the scale of light-waves, and how biology has been doing it for billions of years to accomplish photosynthesis. I think it will be hard to compete with nature in this arena, but I think it’s a wonderful enterprise. In the afternoon session I got to hear mostly about non-biological self-assembly. One talk by Lee Cronin stood out. He makes nano-scale objects that are not made from DNA. That was an interesting change. Almost everything else has been DNA. His structures are not as designable in terms of shape and tend to be much more symmetrical. Still, his approach holds special appeal to me. He made a liquid handling robot out of a 3D printer that iterated hundreds of experimental self-assembly conditions in order to find an optimum. I did something similar a few years ago. I think that robotic approaches to the experimental work are a great way to do science without going crazy. Robots can generate a rich, reproducible dataset that can then be mined for interesting features. This entry was posted in Science on April 14, 2014 by Peter.